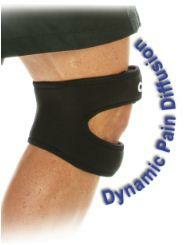 Cho-Pat Dual Action Knee Strap allows full mobility while providing maximum support and pain relief. Along with the benefits of Dynamic Pain Diffusion, it provides an extra dimension of relief from painful and weak knees. The patented design and quality construction of the Cho-Pat Dual Action Knee Strap applies constant dynamic forces to the surrounding areas of the knee, thereby reducing the likelihood of overuse syndromes like Jumpers Knee. The exclusive range of sizes of Cho-Pat Knee Strap ensures a better fit and maximum performance. Dynamic Pain Diffusion absorbs and disperses the pain causing forces to reduce inflammation and relieve stress. Cho-Pat Knee Support applies pressure on the patellar tendon below the kneecap that stabilizes and tightens up the kneecap mechanism, thereby improving the patellar tracking, elevation and reducing patellar subluxation. It further adds strengthening to the kneecap mechanism by applying pressure on the tendon above the kneecap also. This pressure reduces the force of quadriceps on the patella tendon and erosion of the undersurface of the kneecap due to a possible misalignment of quadriceps (Q angle). Jumpers Knee: Jumpers knee is an overuse injury that is common among athletes who participate in sports in which they do a lot of jumping e.g. basketball, volleyball, long jump, but is not limited to those individuals. The term also applies to injury or inflammation where the thigh muscle tendons attach to the upper kneecap pole or where the kneecap tendons attach to the lower leg bone. Weak Knees: Simple wear and tear can greatly reduce the strength of knees, causing pain and discomfort. These are called weak knees and caused by illnesses, injuries and overuse. Is there a right and left brace or is it universal. The right and left braces are exactly symmetrical in shape. So if you want to buy for both knees, choose your correct size and you can buy two in the 'EACH' option. Jumpers Knee (patellar tendonopathy, patellar tendonitis) commonly occurs in individuals who are involved in sports in which they run and jump (basketball, dance) but can also occur in participants in activities with repetitive kicking, jumping, and landing (soccer, dance, martial arts). Symptom of Jumpers Knee is painful inflammation of the tendon usually above the kneecap. Will it help me overcome pain from weak knees? 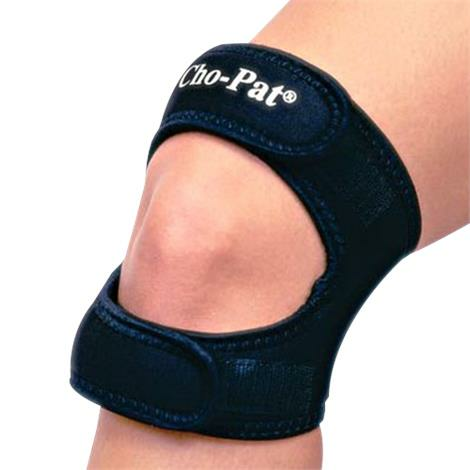 Yes, Cho-Pat Dual Action Knee Strap supports you above and below the knee to provide immediate relief from Weak Knees. It provides unprecedented support to deliver immediate relief. What should I choose if I am between the size range? If you are between sizes, it is suggested that you order the smaller sized Cho-Pat Dual Action Knee Strap. what's the measurement of knee strap . Measure below and above? Please measure circumference at mid-kneecap and select the size you want from the various options available.